Lamp run egg incubator can hatch more than 100 eggs with uniform temperature and apt humidity! It has been designed and developed exclusively for rural poultry farms by Mr. Milan Jyoti Das, Assam based innovator. “Being born and brought up in the village I know the importance of poultry farming in the lives of people in rural India! It is one of the prime sources of employment for many rural youth. They buy young chick and raise them for resale. I felt if they produce chicks within their farm premises then their revenues shall increase. Therefore I designed egg incubator for rural India keeping in consideration the power and financial constraints,” he describes the drive behind his invention ‘the egg incubator’. It is sold under the brand name ‘Nilakantha’. Success rate of egg hatching is 89-90% in the incubator. Egg sourced from hatchery is hatched in 28 days while egg from hen is hatched in 21 days. 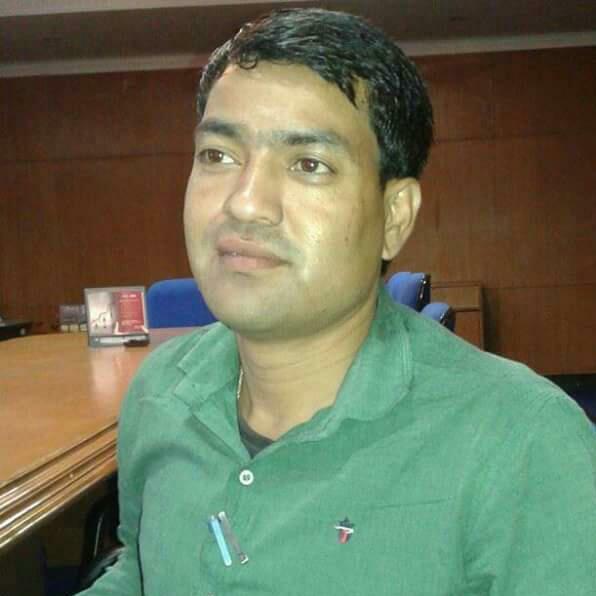 Mr. Das is presently working at Institute of Advanced Study in Science & Technology (IASST), Guwahati, Assam as Innovator. He keeps inventing low-cost equipments in order to make life comfortable, “This is my passion! My other inventions are artificial limbs and agricultural bio-solutions,” he adds. “In the natural process the egg hatches when hen sits on it. This implies if right temperature and humidity is offered then the egg hatches. I thought if temperature and humidity can be created artificially through a lamp then also egg should hatch! Taking the idea forward I did the experiment using a table lamp in the closed metal enclosure. It was successful at the first attempt itself! 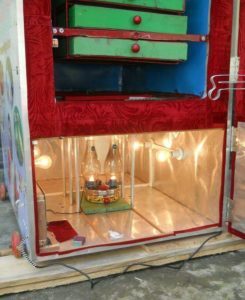 Then slowly I refined the concept, designed and developed two chambers egg incubator that can run on electricity or even on a kerosene lamp,” he elaborates the basic principle of egg incubator. The external body of the incubator is made up of plywood while it has plain sheet inside. The four sides of the machines are about 10 cm thick. Mr. Das has used thermocole for insulation. The upper chamber is the source of humidity thus has the egg tray while the lower chamber is a thermal source where two electric/kerosene lamps are kept for maintaining the required temperature of 37 degree Celsius. “I have given the facility of keeping electric as well as kerosene lamp because there are frequent power cuts in the villages. When the electricity power is not available then immediately it can be replaced with the kerosene lamp. Both the light and the lamp heat up the floor of the lower chamber (ceiling of the upper chamber). There is a regulator (same as one used for fan) by which the intensity of light can be altered. This chamber partition is made up of two plain sheets, so the heat can easily be transferred. For warming, a plate is placed below the egg tray. From the tray water gets evaporated due to heat and makes the chamber warm. In this incubator air is fed by tubes from four holes from the bottom to the upper chamber,” he explains. Both the lamps in the machine need to be working for 24 hrs for 21/28 days. With the technology upgradation the incubator can also be run using inverter or solar power. In case of abrupt change and switches there is also a provision of alarm in the incubator to alert the user. The alarm perks in the situations like power failure, door left open, high / low temperature or humidity. “I have included a digital meter that displays the temperature and humidity enabling users to have complete check on the machine always,” he says. 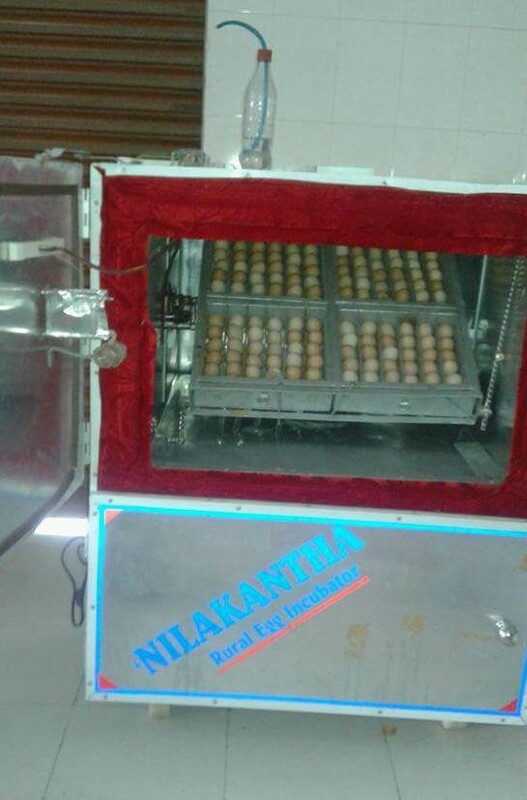 Nilakantha Egg Incubator has been crafted for hatching poultry eggs but the egg tray in the machine can be used for emu or quail eggs too. “Emu egg is quite big while egg of the quail is very small. In the same tray both these eggs can also be hatched. There is no need for the changing the tray,” he highlights. Mr. Das indeed worked to enhance the income of rural poultry farmers by inventing this egg incubator. He consciously kept the selling price of the incubator less than the other variants available in the market because, “I want it to be affordable for rural poultry farmers,” he asserts. There are two models – 100 and 500 eggs. The cost varies between Rs. 35,000-55,000 (excluding transportation charges). 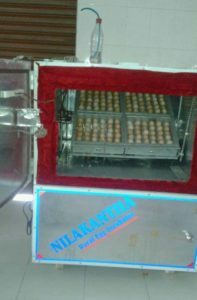 Nilakantha Egg Incubator is being sold across Indian villages since 2010. It is maintenance free machine and operational cost is very less. The delivery period is 7-10 days. In agriculture his next invention would be in vermicompost as he is working on improving the functionality of vermicompost process. “Technology has the power to improve the efficiency of any process. We must make best use of it always!” he signs off.